Description of "HCTL Open International Journal of Technology Innovations and Research (IJTIR)"
HCTL Open International Journal of Technology Innovations and Research (IJTIR) is an international, open-access, peer-reviewed journal devoted to various disciplines of Science and Technology published (bi-monthly) by HCTL Open Publications Solutions and Hybrid Computing Technology Labs, India. Raj Gaurav Mishra is a Managing Director of HCTL Open Publications Solutions, India and is also an Editor-in-chief for HCTL Open International Journal of Technology Innovations and Research (IJTIR). 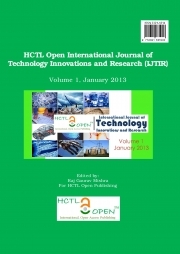 Reviews of "HCTL Open International Journal of Technology Innovations and Research (IJTIR)"